Whether you are planning a birthday party for a lucky 8-year-old, a baptism or a baptism preview here are some great ideas and free printables to get you started! Cause hey- it’s great to be 8! These donut “8”s are perfect for birthday parties, baptism refreshments or after a baptism preview! To assemble the “8”s I used 12 inch skewers, and this amazing nutella baked donut recipe from wonky wonderful. I’m a big fan of nutella friends. (I did substitute milk for water in the glaze to make it a bit creamier). If you haven’t joined the world of baked donuts yet, let me invite you! Yum! And you don’t have to venture into boiling vats of oil…always a plus for me. You will need a donut pan, I have this one and it makes perfect sized donuts to fit two on a 12 inch skewer with room for the tag at the bottom. Print tags (below) on cardstock, punch holes and tie with ribbon 🙂 Easy peasy. My friend’s son got baptized yesterday (in the Church of Jesus Christ of Latter Day Saints this happens at the exciting age of 8) and we brought these for refreshments. You could also package them individually and use as party favors or for the kids in your class/primary as they turn 8. And of course if you are looking at mass production & ease you could always buy a couple bags of mini donuts. In that case you probably want to use smaller than 12 inch skewers. What’s your tradition for kids when they turn 8 or get baptized?? At the beginning of the year when we did our baptism preview in primary I found these adorable printables from Printastic Design. I was in love with the color scheme. I also saw this great (pun intended) idea on Dixie Delights and instantly wanted similar tags that matched the Printastic Design color scheme (call me OCD!) What do you think? These tags are versatile and could be used as name place cards, cupcake toppers, water bottle labels…any other ideas out there? I’d love to see a creative way you used them! We also needed handouts for our attendees with some information to help them prepare for their baptism. Again, I tried to make them to match the Printastic Design printables. 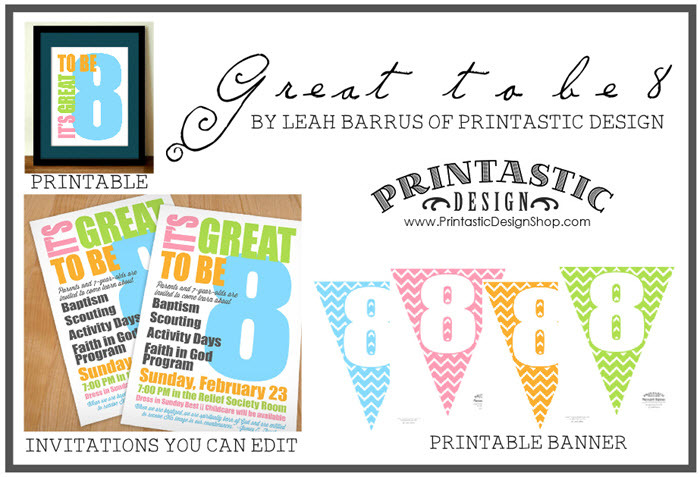 So if you put my printables together with hers you should be set for a well-decorated and coordinated baptism, baptism preview or birthday party! There are 2 separate columns, one on how they can spiritually prepare for their baptism, and the other more of a checklist of how they can logistically prepare. There is a spot for them to fill in their baptism date at the bottom. Print these on cardstock and they can take them home and frame them, hang them on their fridge, or and put it on their nightstand to help them prepare for the big day! Be sure to follow my primary board on pinterest for other great LDS ideas from my fellow bloggers. *All Amazon links are affiliate links- this means that if you purchase something through the link I earn a small commission. Thanks so much for supporting my site!! This post makes me a little sad that my youngest just turned 9! I love the idea of the donuts on a stick making cute little 8s! Thanks for taking time to comment Lara! Hard to imagine one day my littles will be grown up! Great printables and I love the donut idea. Got my wheels spinning. We have a baptism this March. Pinning it to remember! Thanks so much for pinning Camille! These are such cute ideas! My youngest was just baptized a few weeks ago. Where does the time go? Congratulations on the baptism Heidi! How cute! Last year I served in Primary, and so I got to help with the ward’s “Great to be 8” night. These ideas would have been so helpful. Now I’m in RS, so I’ll stash the idea away until my kids get older. Oh I would love to hear what your ward did on their “Great to be 8” night! Thanks for taking the time to comment Nicci! Thank you for putting this together! I love the colors and designs. So glad you can use it Shelly! I am a brand new Primary President (since November) and have been trying to come up with an idea for our “Great to be 8” program. Your design is perfect and absolutely amazing. I can’t wait to use it next month. Thank you so much! Wow what an incredible compliment- thank you so much! I’m glad to be useful 🙂 Good luck in primary! I love this! Thank you so much for the printables!